A friend said to me the other day how they had heard the expression (from their Buddhist teacher) "... the map is not the territory, the menu is the not the meal, the money is not the wealth." Dr Trigant Burrow (1875-1950), was a psychoanalyst, one of the founders of group therapy and the author of The Neurosis of Man (1949). The quote actually comes from his preface to William Galt's discourse on Phyloanalysis (1933). He describes how the 'outer symptomatology' is of no avail in reaching the 'physiological process resident within the organism of man' (p. 8-9). This search of the hungry person for a satisfying meal was a theme that recurred for Watts in his own exposition of Zen and spiritual wisdom. The conversation has turned away from the dinner, to our hunger and dissatisfaction. Ken Wilber, points this out with an evaluative eye, noting how the newer paradigms learn and recite the recipes, but forgot to perform the injunctions, to actually go and cook; to taste the results. In drawing from this premise, in The Way of Zen (1957) Alan Watts compares the path of the menu, being the academic study of Zen, and the way of the diner, being the closed cloisters of practice without reflection or engagement, and finds both lacking. 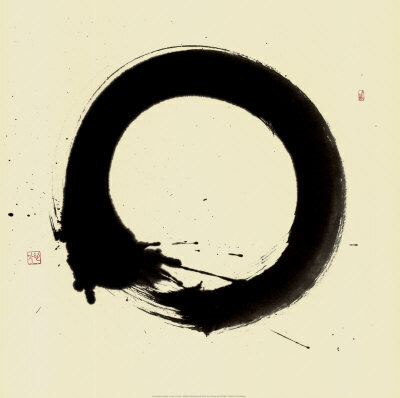 Perhaps, even in Zen, there is a middle-way. Yet the problem is not with balance, between sitting in contemplation and receiving direct instruction in the art of seeking. Each is needed, for conjunction, in great benefit. The problem really, it seems, is in the mistake of the attempt to escape from the dining table (or Zazen mat) into the abstraction of distraction. From Does it Matter? : Essays on Man's Relation to Materiality (1971) Watts gets to the heart of things and talks about the problem of 'abstraction'. This is the human capacity for doing something quite remarkable (and doing that same thing remarkably badly). The human mind has the ability to move beyond the form to the essence of the thing, to be able to consider its symbolic reference, without losing the object of experience. We also have the distinct ability to miss the essence and take a shadow of the quality, making instead an abstract representation as its faint reflection mistaken as reality. To use Watts words: "'But you can always have too much of a good thing. You can easily confuse the measurement with what you are measuring." To illustrate this, Watts draws a parallel between wealth and money. In wealth we have great riches, in money we have only the promise of what it can obtain. The menu contains anticipation and the dinner requires digestion. In a way, we actually prefer the description to the experience. As he describes: "The customer wants anticipation; he has no capacity for fulfilment." (p. 34). When offered the wealth of the lived embodied experience, or the money of prospective unquantified happiness, the choice it seems leads us to want what is always just beyond our grasp. "... the abstract system takes over from the physical, organic situation. As a result, we have run into a cultural situation where we have confused the symbol with the physical reality, the money with the wealth, the menu with the dinner, and as a result we are starving from eating menus." ... in the abstraction of its ever-just-there-now enduring essence. As I near completion of my PhD Thesis write up I realised I needed a distraction from the mental ardour and daily grind. A form of relaxation that was not stagnation, so I thought I might do something manual - a different type of craftsmanship. 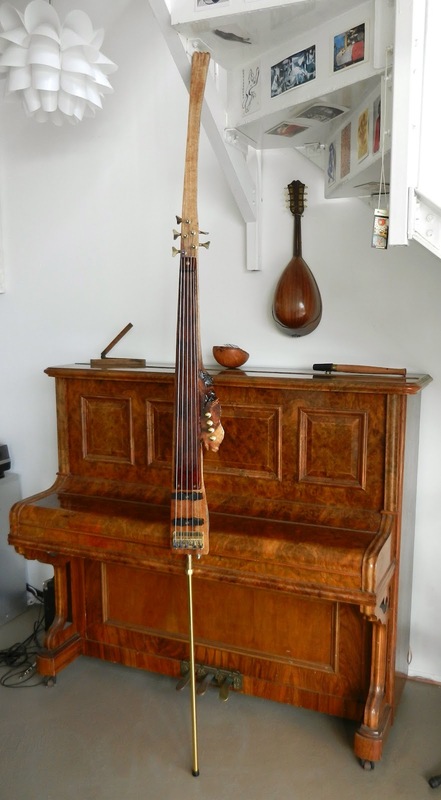 Being an amateur jazz musician and playing an eclectic mix of instruments from around the world, I decided that I would build an upright electric bass. Having played saxophone in quintets, I naturally hear bass lines in jazz - always listening for the melodic rhythm and the signal to the next shift. In signalling to myself for the next shift - it made sense that I would like to make a bass to lead that. I thought this a reasonably easy task - and this is where the parallels with my PhD writing come in. We begin with a fairly innocent idea that does not look too difficult - and find a myriad of twists and turns. I chose to do this simply for the fun of the exercise and to play 'with' the idea (i.e. not being a bass player) and the task became quickly very interesting. The construction of my upright electric bass (i.e. as opposed to an electric upright bass - being a much harder task) began with a length of wood donated from a colleague, lovingly salvaged from a protected forest property in Victoria. This piece of milled timber was rough with bandsaw marks, too short for a length of floorboard, with unworkable knots and termite and borer holes grooved throughout. A saved treasure usually discarded. To me it held great potential. 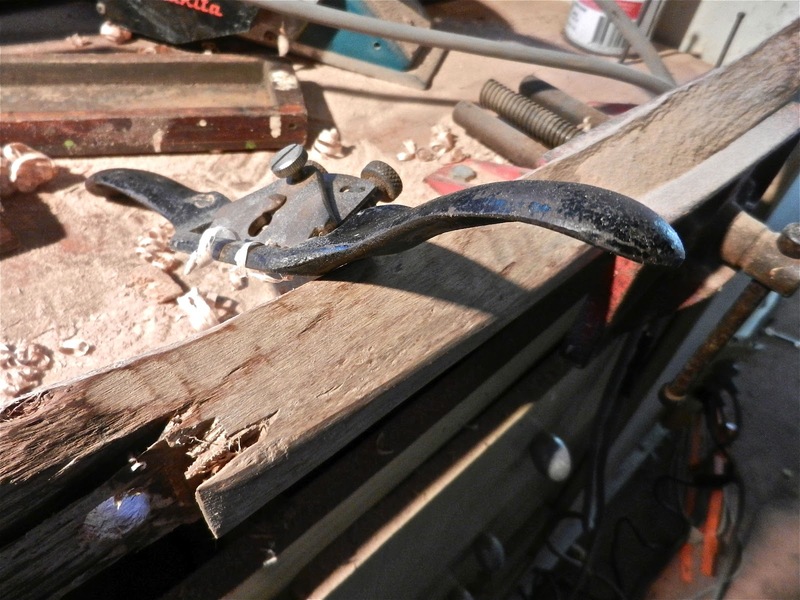 I found there is something honest in working in old wood by hand. A square lump becomes shaped by eye, following lines of grain that resist becoming what is not there already. Like a PhD thesis, the truth emerges as one continues to scrape away, becoming ever more familiar with how the work wants to be - sanding, finding, refining, listening. That is how it is sometimes. The truth of a work is in the removal of the obscurations to find the truth within. It is there and cannot be ignored without artifice, addition and contrivance. Eventually it is better to simply submit and listen to what is being revealed. 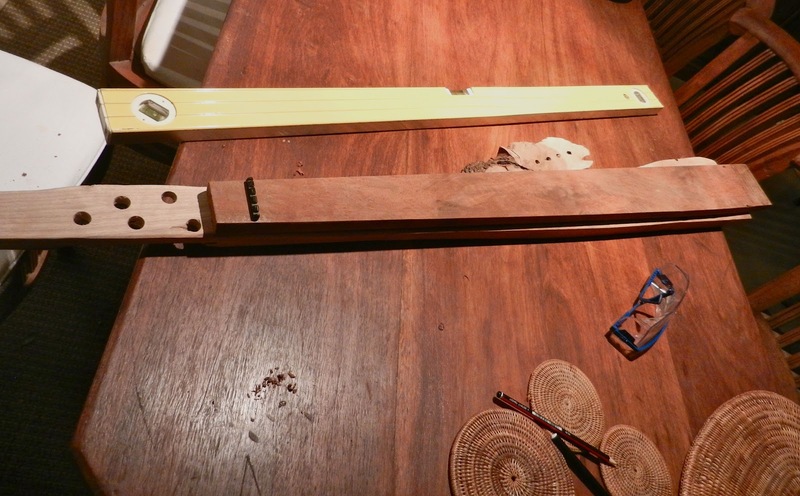 My physical process for producing this instrument, I found, ended up being the same as my mental process in the thesis research. Yours would be different. I'd argue though the level of comparison between any two would be similar. I personally like to begin with an end picture of the finished product, not exact, but simply representing some key criteria. 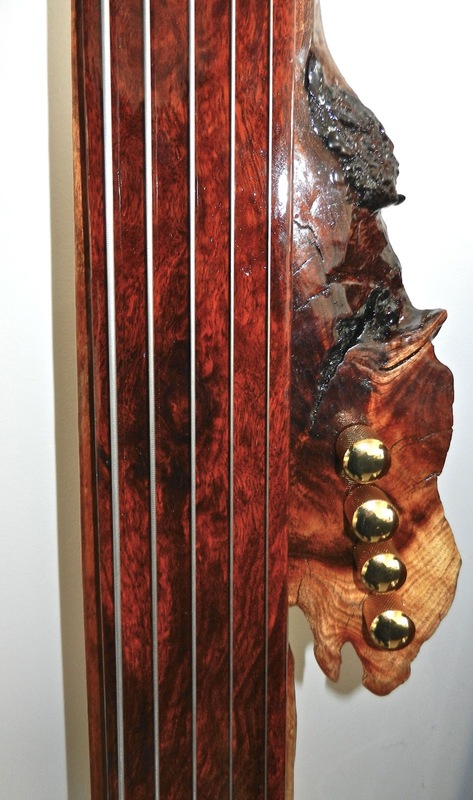 I wanted a fret-less bass that was as much about the art as the sound. It would need to actually work and be practical (i.e. transportable). As with my thesis, these specifications are exact, yet open. There are certain things it had to be useful for - to work to a certain level. Then, like my PhD process, I began with a breakdown of many parts and an overall layout. I usually like to work with what is already available, building on from the discarded to find value in the overlooked. For the bass, I stripped down an old EKS Technology Cyclone five-string from a local pawn broker shop. Naively, I had thought 'how complex can this be'? I mean 5 strings, 5 machine heads, a bridge, two pickups. Easy. Apparently, from my inventory there are 163 parts in my electric bass (excluding the body and the strings). Until you do something, you never know how much there is to do. The whole is more than (but not less than) the parts - and none can be omitted. Again, as a parallel with the thesis - there are always more parts to the whole than appears on a first glance. Fortunately, they fall into groupings and there are repetitions in assembly. Seeing these patterns makes composition an art in observation. Once we do once, we learn for the next time. Also like my thesis, I began with a mock up. I literally took the dimensions of the set up and attached the bass pickups and bridge to the lump of potential wood and strung it up to see if the concept would even work. The wood might split under tension. There might be vibration resonance through the neck. The parts might fail. The wood might be too short, or thick, or warped. A million things might not work - and so better to find out sooner than later. Much was learned and especially that a worthwhile sound could be had without much modification. I like to have proof of concept before I begin. Then, there is the confidence to pull all that assembly work asunder and begin again from the pile of parts to re-assemble from first principles, this time with just a little more knowing. Then came the long hours of repetition and refinement. 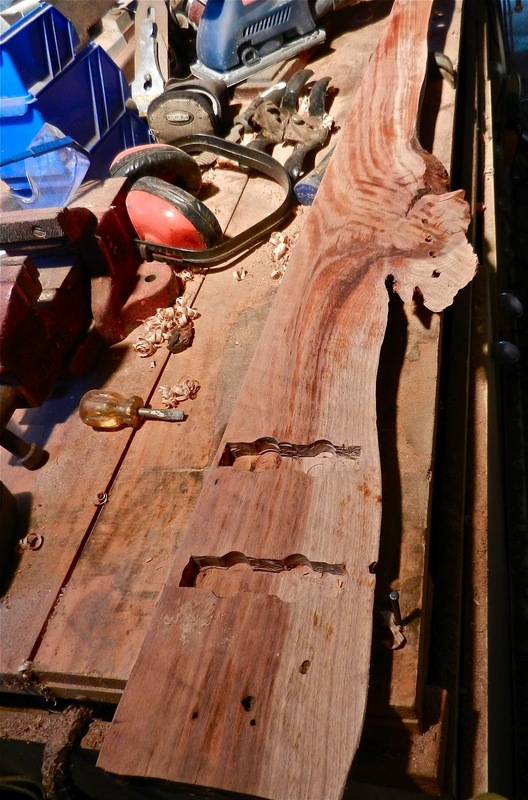 The carving out of the insets for the pickups, jack and sound knobs, the scraping down of the square block into a human flowing form, the multiples of coarse and then fine sandings. 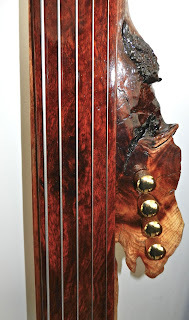 It was with a sense of sufficiency that I began with the first coat of the twelve final layers of varnish. Like the thesis, we begin with the essential form and refine, trim, work and polish until the surface reflects back the self clearly and with brilliance. I learned by this meditation in relaxation that the process by which we navigate and interact with our physical world is reciprocated and played out in how we navigate and interact with our mental world. I have my bass finished now. I find it still a relaxation from the days editing of the thesis. This time, its in the playing. The bulky form refined down to become an elegance of uniqueness. The intention is clear, yet the form is from its own following of what it originally always was. that sings in ways we could not have ever imagined. "Because I am human, nothing human is foreign to me"
Or- I am a man, and, as such, concerned in every business that relates to man. I shall not bestow them upon one whom I know to be ungrateful"
"There is a great difference between not shutting a man out and choosing him." It is this ethical guidance, for a global ethic, which applies to our water, access to the ocean, the right to grow food, to sunlight, to traditional medicines, to knowledge freely shared and - for future generations the resources presently in our custody - that we find ourselves lacking in humanity. For who is not deserving of these basic human dignities. with our sense of humanity. I am continuously interested in this theme of the "Things people [in]famously never said ...". There is something in this phenomenon of 'sociological distortion' that is empirically interesting in the cognitive assessment of psychosystems. My grandmother (who lived to be 100 years old) used to say: "Believe none of what you hear, half of what you read, and a little of what you see." .. but then I might be misquoting her (:-^). I think her context and sentiment in quoting this, in coming from a small country town, was around not passing on gossip. However, my use of her quote is for my own purposes, of supporting my own reflective theme of knowledge humility. This approach, of taking a quote out of context, lending credence to oneself by association, and co-opting it for one's contemporary social interpretation (that I have just demonstrated) is a fairly harmless form of personal aggrandisement. We attract others of reputation to lend support to what we would have liked them to say on our behalf. The problem only comes when the rhetorical device works and a sociological truth is manufactured, often from a source that would deny it. Once spread by others, the genie is out of the bottle, and the container was lost. Here (to add to the collection) is a new one. Another example of the Law of Karmic Distortion. 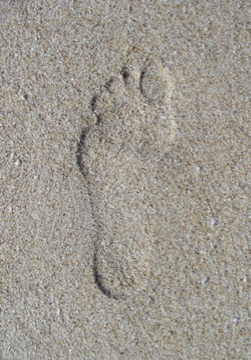 This is often used as an expression of veiled humility, sort of a qualification to lend verification to the sub-text which says: "... and while we know we have a perfect map or model of reality, we also realize it is an approximation, but short of walking the terrain itself, it can be relied on." The problem with the quote is, not that it is grossly inaccurate, but that it is the most insidious of re-representations, the edited fragment. My understanding is that in outlining a formative version of the Theory of General Semantics, central to which is the proposition that words are not the objects which they represent, Korzbyski used the metaphor of maps, specifically one to get from Paris to Warsaw via Dresden, to represent the structure of his semantic argument about semantics. 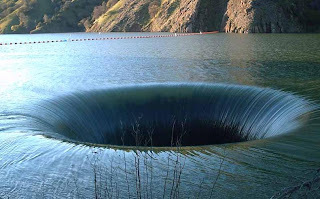 Ironically, the words of the metaphor are used to represent the theory itself, and the theory is overlooked by the quoters. "A) A map may have a structure similar or dissimilar to the structure of the territory. C) A map is not the territory. D) An ideal map would contain the map of the map, the map of the map of the map. , endlessly." The disconnection of the quote from its context, makes it a dangerously partial representation. In changing the structure of the quote, the representation (i.e. the map of the argument reduced to one sentence) becomes, not lacking in detail, it becomes really a fabrication - and in terms of awareness of its semantic distortion, dangerous to rely on. "Two important characteristics of maps should be noticed. Korzybski, A. 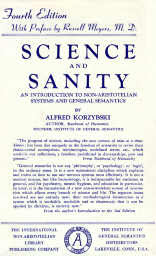 (1933) Science and Sanity (4th ed.) The Institute of General Semantics, Lakeville, Conn.
"It would lead us astray, and we might waste a great deal of unnecessary effort. To make up the [in]famous mis-quote, Korzybski's own structure is changed, from two important characteristics, to merely one. It is in our active distortions that the potential for suffering and disaster in reliance occurs. This is the source of concern as to why such seemingly small omissions do matter. The fourth criteria of Korzbyski, that the map should be qualified by meta-relfection, is by its absence, the cause for this form of distortion. Interestingly, the mis-quoter might say, to add insult to inquiry in the irony: "What are you worried about, isn't it just semantics?" To be fair, the wider effects of social distortion on our capacity to know and discern, are brought about, not by those navigating the territory honestly and passing on possible directions heard, but by the casual map-makers working without responsibility in remoteness. If we assert a representation, we almost have a duty, to at least make the inquiry of its structural integrity, before it is passed on for all eternity. In apithological ethics, this is called the philosophical coherence of 'Rhetorical Responsibility'. In humility, if we use an authority to support our own polemic, an effect is that others might be convinced by our semantics. If the representation is false, then all might be lost, not just by us, but by all. Not only is there wasted effort, there is something else here, which is a diminishment in our faith in knowledge and its purveyors. This is notwithstanding the loss of an act of simple respect, that in using someone's life's work for our own purposes, it might be respectful to at least read, even a few words in context, of what the author themselves wrote for us. Perhaps this applies even more, when the author saw the great gift the evolution of information from our knowledgeable past gives to us daily, for our own day to day survival. ... might we each pause briefly to look at the structure of our own arguments, before we unknowingly send others off with false directions? I was reading journalist and author Arthur Koestler's 'five' part trilogy again recently. That is The Sleepwalkers (1959), Act of Creation (Book I and II) (1964), The Ghost in the Machine (1967) and Janus: A Summing Up (1978). The work as a whole covers an investigation of immense ground and circles back on itself, yet within it is the story of the how humans discover and how we discover our humanity. The awareness of knowledge hubris is a theme in the conclusion to all these books. "Let me repeat: the principal mark of genius is not perfection, but originality, the opening of new frontiers; once this is done, the conquered territory becomes common property. .. 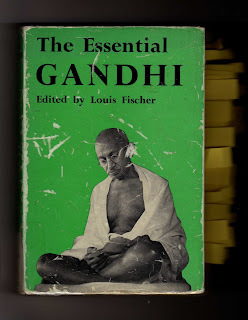 Genius consists not in the perfect exercise of a technique, but in its invention." Koestler then speaks to the affectation of greatness and of great art. We feel that seeing these objects we may be magically imbued with the creators' essences. "It is not the eye that guides the museum visitor, but the magic of the names." (p. 410) And so people view these works appraised as great and project their own likes and dislikes upon them. I then asked why does this occur (and why did it bother Koestler so)? In apithology, we know the expression of pathology arises from the doubt of grace. When we feel we are not able to gain an appreciation for something, it being too intricate to know or too distant to discover, we fear we will lose the grace of its expression. Fearing this greatness might be unavailable to us, we grasp to its artifact, and look to others to affirm the value we cannot see for ourselves. Our fear of deficiency is confirmed and so compensated for, the art itself becoming invisible under the introjection of acclaim. This is why greatness without pretence is the best judge of genius. Being respected by one's peers, and ignored by all around, is a much greater respect than drawing queues of people around a block to glimpse something proximate that is forever distant. In moments like these I give great thanks for the many peers around me, without whom in their greatness, I would have no sure judgement for my own attempts at stumbled origination. To create takes courage and to appreciate takes devotion. Not all of us can feel into this path, to create value so as not to confuse value. My own response in this area is the distress I feel when in crowds of people who are trying to have an experience of greatness, knowing there is something there to get, and not getting it. In these moments I find the authenticity of non-appreciation much better than the false acclaim without a moments look. 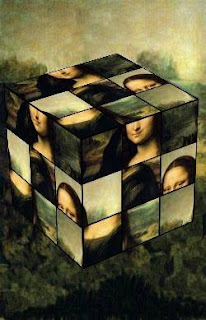 One day in Paris' Louvre I saw Leonardo's Mona's smile for the first time - and knew somatically and completely the reason for the reputation. Behind the ten-deep crowd of viewers we shared a smile, and after a moment I left in increased respect and moved on to the much-ignored passions of Christ in Botticelli's creative recall in an empty gallery, which the tours having not the time or cultural interest, had passed by. Art is more than personal, it is a view into the divine. I have a van Gogh reproduction on my stairs. It is of Starry Night. It was a gift on a birthday many years ago from lover and friend. Like Koestler's portrayal of a friend with a Picasso that became more valued once discovered as an original, it recalls for me each time I see it those faded days. This begs the question of whether the painting is more cherished simply because of the artist's reputation or the givers giving. Compared to the other original art I have, especially those where I knew the artist, it is a but a parchment, yet it holds a symbolic cherished value - in distant appreciation and remembered affection. Within the art is the act of giving, and that is what is mostly valued. - and shop a little in the gallery-giftshop stocking the grace of all mankind. I am particularly taken with the work of Chilean biologist, Humberto Maturana (1970, 1974, 1975, 1980, 1981 ...). When you see a body of work that leads to a coherent alternative epistemology described with economy and elegance, it is these artifacts that inspire the researcher. Of course, there is the opposite effect of becoming intimate with such work too. Maturana's writing is described as difficult, that having a new perspective, it generates new language, and so a new form of reading without assumptions is required. New thought, involves new mind, and a seeing with new eyes - yet with a tired set of old eyes, what do we often see? What we find is the question the work uniquely answers, is often asked and answered - without making any real use of its true benefits. This made me reflect how in the truth of Maturana's theory of structural-coupling in autopoiesis is the effect that the history of experiences, the forms of paradigms of practice, the way language is seen, and the pre-assumptions of perceptions (i.e. reliance on the observer description) - means this work cannot be adequately seen. Yet it does not change its truth. Let's consider for a moment the implications of autopoiesis, structural coupling and praxogenesis. With regret I will use a simplified form, as otherwise there is no alternative to quoting the original work from Maturana and Varela (1970, 1974, 1999) in its entirety, which is sufficient and complete in itself. The effects continue, as entities, their domains of interactions, environments of creation, co-enact and interact in an ecology of evolving simplicity - devoid of observer descriptions as a necessity. As sensori-motor coupling, leads to embodied action, which creates enactive co-enaction - the context for interactions is altered recursively. The result is that the origin of formation is found in the qualities of the structure of the domains of cognition. A first orientation to a particular phenomenon becomes a sensory predisposition, which enacts recurrent actions, and recursively the world is made thus in the direction of embodied perception. The origin of existence is found, when seen as the entire sequence as one event, in first actions (i.e. genesis in praxis ~ praxogenesis). The embodied actions causes the environment of perception. Evolution is, we find ultimately, caused by orientation. The simplest example I can think of is of two birds nesting, the interaction of their actions within that domain in seeking and feeding on insects to feed their young mitigates the effects of the insects on the trees and enables the recurrence of nest building sites and these interactive domains become, over time, an ecology of forms. The distinction made in Maturana's characterisation is that evolutionary natural selection is a consequentialist description in the domain of the observer. As the environment does not cause a change in the entity, only triggers a change that is mediated by its cognitive structures (Mingers, 1995) , evolution rather than being environment dependent, is entity dependent. Evolution and environmental enaction is dependent on entity cognitive structure. In Niklas Luhmann's Ecological Communication extensions of autopoiesis into the social domain of radical constructivism clarifies how the 'environment' is an object in the linguistic domain of the social system. The one thing not described when we speak about the environment is the physical medium in which we are situated that is outside language. This is a description in semantic-coupling that is unavailable to us from within. The sustainability-environment debate is a conversation that occurs solely within the language of the social entity. Luhmann, mentions, but does not deal with, psychic-autopoiesis (the co-enaction of individual cognitions), and fortunately this is now being dealt with in the field of psychological panarchy. The implications of this are simple, profound and radical. Our semantic domains (i.e. talking about the environment) as a product of our cognitive domains (i.e. thinking about the environment) will determine if our viable medium for living (i.e. our actual environment) becomes hostile or benign for the conditions of our existence. In answer to this question of our mutual co-enactive fate... perhaps the future history of our species (as observed by a later passing observer - or our children's, children's, children, depending on our proficiency) will be our only Witness. I completed an art piece today. I cannot remember the time when I actually took the day off from other duties to simply make art. I might say that I am not an artist. Yet, in a way everyone is. We create a meal, a mood, a moment, a motion, a monologue. What I realized is that it is the craft that is the practicing artist's distinguishing feature. Everything is in the execution. I began to recall my favourite beach of over twenty years. Discernment of difference led to eight divisions ... as beach, shore, breakers, waves, froth, mist, ether, spirit ~ began evoking the textures of each. Colours on canvas reflect different lights and paint has a will of its own. My abstract art becomes a realist interpretation. The cosmos has a little laugh at me and my intentions. We are all waiting for white, the formlessness of form, the union with Union, the one with Oneness, ... and it simply will not manifest in less. Instead, simply more intimacy with the ever-increasing evolutionary beauty appears. 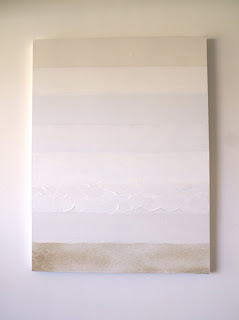 Eight shades of white on a white canvas and what appears - ... the all of everything. ... and there we are. Perplexed by the inadequacy of visualising trichotomy dynamics in two dimensional graphs, I have begun modeling some of the adaptive cycles for psychosystems as 3D models. Yes, warning science content and nerd alert, ... yet in essence this seeing in many ways affects us all. In examining the feeling of vertigo from following the contours of the spatial dynamics of the phases of conservation, release, reorganisation and exploitation in the adaptive cycle, I had a deep feeling of deja vu. Where had I seen the 3D adaptive cycle previously? He goes on to describe how 'anxiety and rigid functioning' accompany the crisis that occurs following a period of adequate coping with the problems of existence [conservation], with regression in using older ways for newer problems then leading to 'fixation and pathology' [release], creating dissonance and new insights which have to overcome existing conditions in the existential space [reorganization], before the removal of those barriers leads to rapid movement and a quantum leap to the next steady state [exploitation]. Here is psychological panarchy described thirty years prior to its naming. To see a description of psychological multi-state resilience, in a systemic population model, in four phases, as a hierarchical open system of complexity, preceding the publication of Buzz Holling's pioneering work in ecological systems by some years, affirms the significance of this early and innovative research work. Who would think that this understanding might have been lost to us, or that were it not for the 35 years of ongoing inspirational research work by the resilience theorists, we might not have even understood its profound significance for our own emergence. All we can do at this point is marvel at what they together saw and continue to ask, now that the cyclical nature of natural systems (including human thought) are disclosed, what is it we must do ...? Something is up in the human hive. If we think about evolutionary intelligences, the metaphor of the human hive discloses something about ourselves, not just at the city level, but at the humanity level. While we can't know these things clearly (being mere drones within the system of emergent patterns), I suspect until this point the metaphor of the hive did not really apply to humanity, only to the colonies of our parts. Our cities and organising structures (i.e. trade cartels, workforce corporate identities, professional designations, and even generational patterns of consumption) have been our isolated hives, which together accumulate as the patterns of mankind and its effects on many landscapes (physical, sociological and psychological). 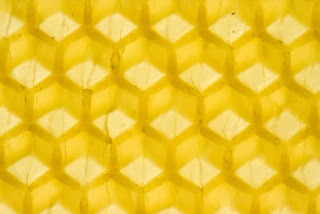 Yet looking to the clues within these meta-patterns, the divided hives are now becoming connected autonomous functions within a larger collective organisation. Something new is newly happening in the human hive. While its simply misleading to take and stretch a metaphor too far, or to apply observations of one phenomenon that exists only in the eyes of the observer and apply them to other systems without new observations, what might the amateur apithological apiarist see happening right now in the human buzz? One event is the launch of the connected and universal 'Like This' voting in the ever expanding and interlinking social network space. This will communicate collective information in new ways and prioritize information to awareness, both for astute use and in collective delusion (and perhaps manipulation) exponentially in feedback loops outside the governance of our previous close trust relationships. Another is the expansion of the virtual-teleconference experience where networks of people previously unconnected are now simultaneously connected into discourses previously outside of their reach. We have new content and new communication. The big two in apithological integration. We are seeing the lead up to the decision of direction in Intention in fractal forums where ever the question is being asked at a sufficient level of complexity to reflect the question with integrity. Like the human hive, bees in the period prior to swarming have patterns of confusion which move eventually to resolution. There is, however, firstly a period of incoherency before a quorum in the decision making arises. The piping tune, heralds triumphantly the new direction found through the 'checking-out' of places recommended in a complex multi-criteria process of collective site rating and selection. The similarities with Web 2.0 are easy to formulate. In making this comparison we should distinguish between the swarming of bees that occurs with the hive 'propagating', splitting in situations of abundance - and the alternative of the hive 'migrating' in scarcity when the environment begins to appear unviable and new territory is required. The dynamics are apparently similar in external behaviors to the casual observer. Yet, just like in the patterns in the transitions in levels of consciousness, they are very different in their motivation, form and effect when motivated by sufficiency or deficiency. Possibly one leads to a new location armed in hope with confidence, the other in cautiousness and defensiveness with all lacking in a sense of abundance. According to Michener (1974) in 'The Social Behavior of the Bees: A comparative study', the capacity for complex communication in eusocial bees is what enables the evolutionary advantage of migration in pleisiomorphism. How the mysterious formation of an intention to leave for a new nesting location in response to unsuitable environmental conditions is formed, is unclear. He notes: "... a sharp difference exists and no intermediate conditions are known, so that understanding of the origin of Apis swarming is not so easy." If the existing colonies of humanity are our thought communities located around single ideas (our metaphorical queens of memetic reporduction) it is the capacity of our networks for communication that will enable the evolutionary leap to a single unified location. The new 'nesting location' for humanity is its common intention as a single eusocial entity. It is worth noting that the queens are pushed from the hive. They do not lead the swarm. No one existing idea will lead the way. In the usual pattern of propagation of the hive in situations of abundance, food collection declines as storer-workers increasingly refuse to accept food from foragers, with foraging activity becoming a search for new nesting locations, the role of foragers moving to scouts. In migration (known as absconding) different triggers may need to occur. What we do know is for both patterns the trigger to actually swarm is the 'buzzing run' where pheromones and vibrational signals are rapidly spread communicating the moment of decision and the signal to depart. It is this I am listening for. What is also interesting is how the bee life-stage progression from cell cleaner, to nurse, to food storer, to forager is both developmental and yet highly diverse in its sub-roles, and how transitions in population cycles probably create overall mitigating responses to fluxing role-needs as the fortunes of the hive change (see Seeley, T. (1995) The Wisdom of the Hive: The social physiology of honey bee colonies). If we think about the changing population in the spread of generations, differing roles in global production and developmental levels in the human hive, perhaps the 'fifth' life-stage role we are about to see is the 'migration monitorers' who trigger the relocation of the hive in an environment of decline where food and foraging conditions have created the consternation of confusion. Who will be these guides to a new location in thought when propagation of separate hives is no longer the hive's primary question?